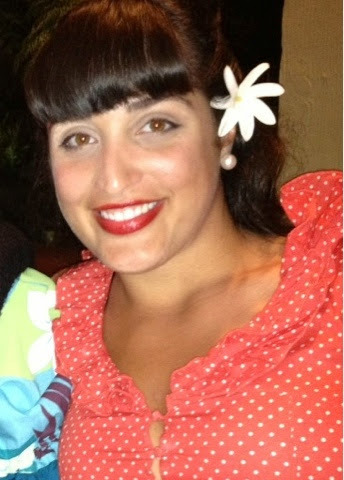 Milan of Hawaii: The vintage violet. Growing up in Hawai'i, there are flowers everywhere year round. Big, beautiful, colourful and often fragrant flowers that decorate the front yards of homes and give bright pops of color in the green forests. I'm talking about hibiscuses, plumerias, gingers, tiares, and puakenikeni, among others. Some of them are so common that they become part of daily life beyond decorating the garden. In high school, the first stop in the morning for many girls was to the spots on campus where flower trees grew. These were usually tiare or puakenikeni, which are two of the most fragrant flowers. We would pick a flower and wear it behind the ear for the day. The next day, there would always be another flower in bloom to wear. A beautiful flower for every day. You know, just regular life in Hawai'i! Here I am in 2012. That's a tiare flower behind my ear. Once I moved to Sweden I realized just how special it is to have these wonderful flowers all around you any and every month of the year. But when the Swedish winter freeze thawed off I discovered that Sweden too has wonderful flowers that were quite exotic to me. These were flowers that I had only read about in books and had never seen or smelled before. Some of my favorites of these exotic (to me!) 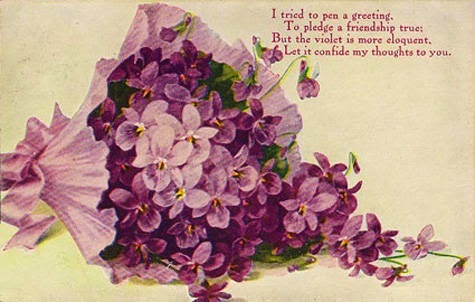 flowers are lilac, hyacinth, daffodil, sweet pea, and honeysuckle. My very favorite of these is violet. Violets are perhaps my favorite flower of all time. If there were violets big enough to wear behind my ear, I would wear them all spring long. I adore the color and scent of violets. To me they seem special because they grow in very particular places and always on their own terms. Most grow naturally and if you decide to plant them yourself, they'll decide if they want to grow there or not. Sometimes they spread thickly in an area, turning a patch of lawn or field a beautiful shade or purple. 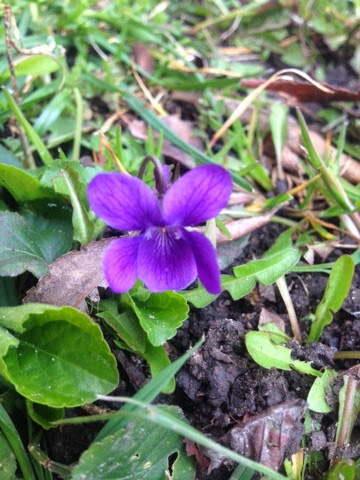 Other times you'll just find one independent little plant, just like the very first violet of spring that I saw last week. For some reason, violets seem to be a bit of a forgotten flower. The flower was once very fashionable at the turn of the century and was associated with love, modesty, and faithfulness. 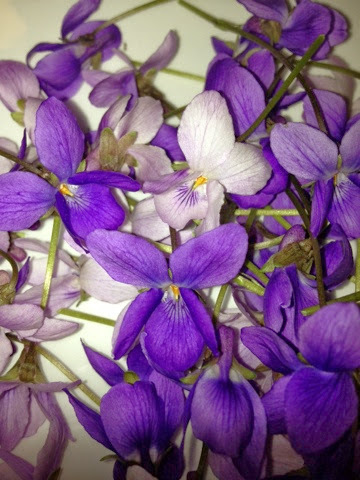 Not only is the violet a beautiful flower, but it also has a wonderful smell and flavor. It is edible and here in Sweden it can sometimes be found as a candy or ice cream flavor. My all time favorite ice cream flavor is violet (no surprise there) and finding it is even rarer than finding a real violet! While still available, violet confections seem to be somewhat old timey and aren't widespread. Candied violets were a popular confection at the turn of the century, and they are as violety as violet candy can get! The recipe is quite basic but making them is a painstaking process and really is a labor of love. I made them a few years ago when I had violets growing on my balcony. They're beautiful on cakes and other desserts or are just dandy to eat on their own, old school style. For those of you who live in a place where you can get a hold of violets, here's how to make them: Start with fresh picked violets harvested from a clean place. No roadside violets or dog park flowers here, please! Rinse them gently with cool water and gently dry off each flower by dabbing them with a paper towel. You will then need to prepare a bowl of egg whites. One egg white might be enough depending on how many violets you have. Coat the violets with a thin layer of egg white. To do this you can either dip the violets one by one into the egg whites or you can use a paintbrush to coat them with egg whites. Thoroughly coat them with egg whites in order to preserve the flower. You will want to keep a toothpick handy to open up any petals that have stuck together. Place the egg white coated violets on a wax paper covered cookie sheet. Sprinkle them with castor/fine sugar. 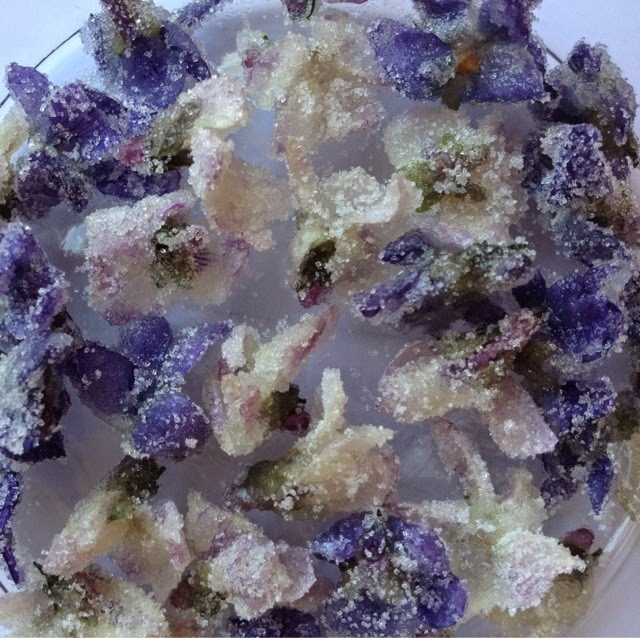 Be sure to use fine sugar and not regular white sugar as the finer crystals will melt onto the flower more readily than regular sugar. Cover the violets with sugar on all sides. Let them sit in a dry, well ventilated place until the egg whites and sugar have dried and the flowers have hardened. You can then store them in an airtight container. 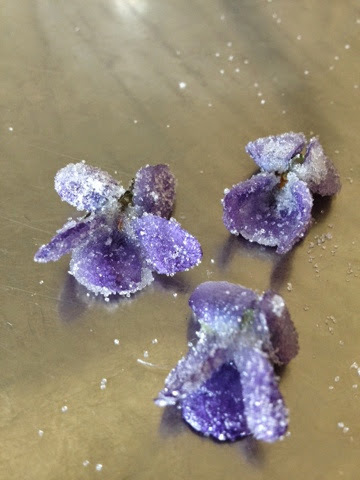 Let me know if you decide to try making candied violets! I'd love to hear how it went for you! And to follow the violety theme, I recently bought a purple 1950's dress that I just need to share. Okay, maybe it's more lavender than violet, but whatever. I'm such a novelty print nut, so it's unusual for me to choose a solid color dress. But just look at the buttons and bow! And the matching bolero! So cute. I can't wait for it to arrive! Do you have any favorite seasonal flowers wherever you live? Tell me about them!